Ever wonder HOW to help your STRUGGLING READER? When your child struggles to read and learn, sometimes you may feel as if you’re banging your head against a brick wall trying to find the proper help. Let’s remedy that. Let’s fill up your toolbox with fun, effective, easy to implement activities that improve mental processing skills and change the way your child learns. 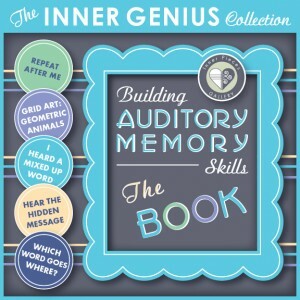 Today own EVERY cognitive enrichment activity in the Inner Pieces Gallery store! Does your mind ever take you to the worst case scenario when you worry about your child’s educational future? As learning difficulties continue to pile on top of each other, there your child is, feeling more and more inadequate. There you are, feeling more and more helpless to do anything but watch it all happen. Please know that you DO NOT have to feel powerless. Neither does your child. You CAN change the trajectory of your child’s dwindling confidence and begin the transformation from struggling student toward strong, capable learner. I’ll provide the tools. You’ll become my conduit for delivering fun, effective cognitive strength training that improves children’s ability to learn. 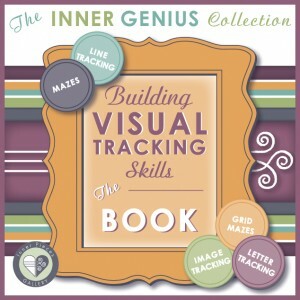  Visual tracking skills allow us to efficiently track our eyes from left to right. This helps us read with better fluency and even helps us complete tasks quickly. 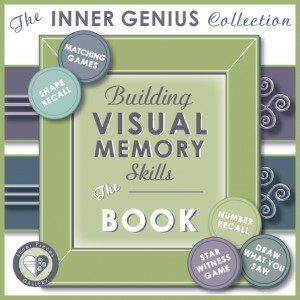  Visual memory skills allow us to remember information we take in through our eyes. Trouble with spelling, reading comprehension, and the ability to copy written information quickly may indicate visual memory deficiencies. 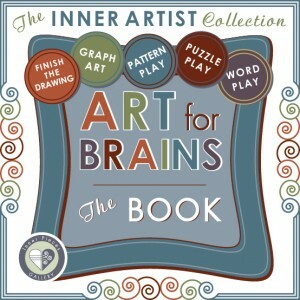  I designed Art-for-Brains – THE BOOK to merge cognitive enrichment tools with a bit of artful playtime.  Each of five activities in the book targets a specific learning skill. That said, most of the activities have the added benefit of strengthening multiple skills at the same time. See each of the individual activities below.  Finish the Monster Drawing targets visual closure skills, which allow us to recognize complete words rather than only the individual letters or parts. Children who struggle to learn sight words, confuse words with similar beginnings or endings, and have trouble with big picture ideas may benefit from visual closure activities.  Graph Art for Auditory Memory targets our ability to remember what we hear, including our own internal voice while reading. This improves listening skills, following directions, reading comprehension, and phonics based learning.  Dot Grid Pattern Play targets visual figure ground skills, which allow us to distinguish between foreground and background and not become overwhelmed with too many words on a page.  Visual Spatial Puzzle Play targets spatial awareness, which helps us understand size, distance, volume, order, and time. It helps us know our left from our right, keeps us from bumping into people (personal space) and lets us know how far to reach across the table to grab that pencil, among other things. Students who struggle with math, handwriting, and map skills may benefit from visual spatial activities.  Many students with learning difficulties have trouble with linear thinking. This means that telling time and keeping track of the days of the week and the months of the year are common challenges. 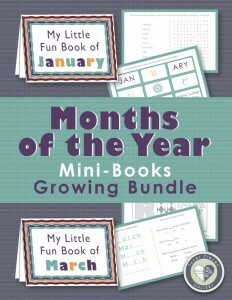  The Months of the Year Bundle includes mini-books for every month of the year, January – December, providing extra calendar practice using word searches, fun cut and paste activities and more.  Auditory memory allows us to remember what we hear. Students who struggle with reading, reading comprehension, vocabulary, phonics, following directions, taking notes while listening, and completing assignments may have deficiencies in this area.  Unique learners often have trouble with linear, sequential concepts such as the passage of time. 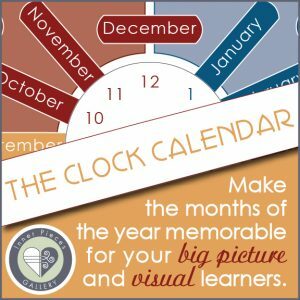  The Clock Calendar offers a fun, visual way of learning and remembering the months of the year that’s as unique as they are! 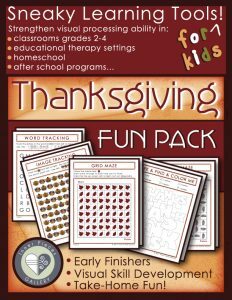  Holiday Fun Packs offer a terrific way to practice skills in a way that feels more like a treat than exercise for the mind.  Enjoy 10 activities in each fun pack for Halloween, Thanksgiving, and Christmas. Total value of everything above = $121. Today own it all for $59! how to help your child when you notice specific challenges. 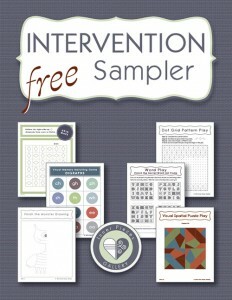 Whether you’re a parent, an experienced teacher, a special educator or even a tutor, the Intervention Sampler is a valuable resource to keep on hand whenever you’re scratching your head wondering WHAT is going on. Thank you so much for this. My son is struggling with some processing issues and your item is a great help for me as we try to unlock the mystery. Don’t worry. You don’t need any special training to implement these tools. A desire to help improve your child’s learning experience. The ability to read detailed instructions provided with each activity. And just in case you have questions about the instructions, remember I’m just an email away. Clear, easy, interesting, and most of all, it helps! I designed most activities with early elementary in mind. Of course, learning challenges occur at all age levels. That’s why I included tips that help you adapt activities to fit your child’s specific skill level. So, whether your child is in kindergarten or middle school you can easily make adjustments to increase or decrease the difficulty. As always, please keep the Goldilocks standard in mind when working with your child. Not too easy. Not too difficult. Juuuuuust right! Used this during this past school year with one of my students three to four times a week prior to the school day. Made a huge difference for him! Thank you! Nope. Owning everything in my store will NOT turn you into an instant educational therapist. Owning everything in my store will NOT be the one and only solution to your child’s learning difficulties. The proactive steps you take today, however, may save YEARS of struggle and heartache in the future, and help YOU become the solution your child needs. Take advantage of this special ONE-TIME OFFER. $59.00! Use the code included in your email. Offer expires soon. You won’t see this offer again, so act now! Note: Clicking the BUY NOW button transports you away from my site to a lovely place called Gumroad. I chose them because they are much better equipped to keep your credit card information secure. Yep, they’ll ask you for your email address… AGAIN. Please provide it! That’s the only way I can send you updates when they arrive. And remember, check your email for the code to use at checkout!